I'm super excited to be teaming up with Mimi Boutique for a fabulous handbag giveaway. One lucky Fash Boulevard reader will win the Francesca Satchel in the color of their choice (subject to availability). To Enter: Like Mimi Boutique's Facebook fan page here or follow them on Instagram here. And follow me on Facebook here or Instagram here. Don't forget to leave your e-mail in the comments below so I can contact you in case you're the lucky winner! The contest will run until May 11th. Good Luck! Lovely look and fabulous giveaway! Don't miss today my look including an amazing Two-tone Solk Blouse, a touch of rock style and amazing crystals ankle boots. Great signature piece, perfect for upcoming summer! Those handbags are amazing ! Hope I win! oh my god , i love them all .... my favorite would be the red one but it doesn't matter they are all great !!! Your scarf is gorgeous! I am happy I now know about Mimi Boutique! I'd love the be the happy owner of the blue version of the Francesca Satchel, because it is easy to match with almost evry outfit, even though it doesn't seem like it would be easy. Also, it would be a perfect item for making a color statement with an all black outfit. Therefore, a definite musthave! You always look so amazing, Anna. This bad is fantastic. They are absolutely wonderful and the bag fits so well with the rest of your outfit, the scarf especially. Love it! You look amazing, as usual. So happy I now know about Mimi Boutique! Those bags are amazing. Hope I win. Hello Anna, I am totally in Love with Mimi Boutique,they always offer fashion forward, stylish handbags. I love the red,the black and the blue...hard to choose!!! I have being looking for a big handbag like that, as a mom that is just perfect for me, plus is so beautiful...I am in LOVE!! I would pick the blue!! Yay, thank you for the opportunity!! The blue one is my favorite! I liked Mimi's and I already like/follow you on both! following both you and Mimi boutique as Meghansilvasblog , don't own a iphone so bummed I can't enter via instagram , loving the prize a girl can not have enough gorgeous handbags! Stunning outfit, the bag is really great!! LOVE this bag! I follow both you and Mimi Boutique on Facebook! What a gorgeous bag! I also love that scarf you paired with it! Love this post and the bags from their boutique. I liked both your pages and Mimi's fanpage. You look beautiful too in that scarf. LOVE the burnt orange colour! It is just the punch of colour my summer wardrobe needs! And the scarf you're wearing is adorable. Check and check! The orange bag would be the perfect pop of color to get me through summer! Thank you so much for the opportunity to win! P.S. 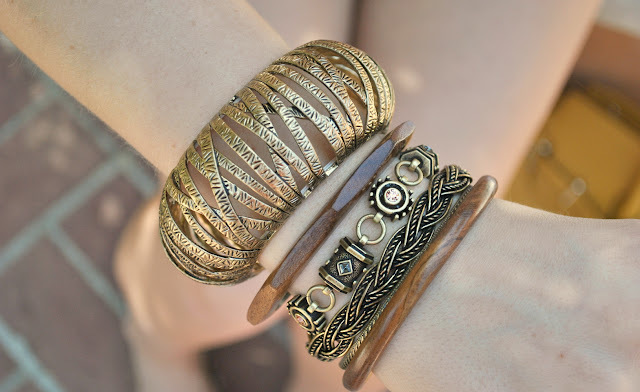 Love the wooden bangles, should have snapped those up while I had the chance! ahh the blue one is gorgeous! I love the contrast between your white dress and colourful accessories! What a great bag! Cool giveaway! I love the blue one! Thanks for the giveaway! They're all so purty!! Thanks for the giveaway! Those bags are gorgeous!! Hope one makes its way to Miami! ooh, these are fantastic! I love that mustard color that Anna has. Awesome giveaway! Loving the blue and tan bags! Super cute!! I love that bag with the scarf...such a good combo!! Wow...it would be hard to pick just one! I love these....and I love your scarf! Love the scarf so bright and fun ! as usual i adore the black or blue purse! i love your style, so chic. thank u so much for the sweet comment on my blog. I really like yours. Oh this bag is fabulous!! I liked both on Facebook! I already follow you, and liked mimi boutique on FB. I love the pinkish colored satchel, they are all adorable! I would the the black - it goes with everything! I followed on FB and Instagram! P.S. Following Mimi Boutique and Fash Boulevard on Facebook. LOVE the blue one! My email is thesequinedspaniel@gmail.com! Love the red and tan bags!! So chic! I follow you and Mimi Boutique on FB. I love the orange Francesca Satchel. Love your scarf and the bag is to die for! Also followed on Facebook :). This satchel is gorgeous! I liked Mimi Boutique's Facebook page and I follow you on Facebook as well! Loving these bags! I may have to get some (yes, that was plural) myself if I don't win one ;)! thanks for stopping by www.thesecondbestblog.com! so so so cute, I'm obsessed with that tan one! Great giveaway! Such a classic handbag! Fingers crossed that I win! Love this bag! It would be hard to pick just one color! I want the red bag. So chic. I am following. I love this bag! Love it Love it Love it! That scarf is gorg too! I really do need a chic black purse. Just love that bag :D And love your blog as well! This bag is stunning in every color! I think I like the mustard the best tho! I love the blue one! I follow you and Mimi Boutique by the name: www.facebook.com/LauraLilyBlog. I always love ur outfits. how cute is that bag!!!!! Following both on facebook and instagram! Love love the bag!! awesome giveaway! Love your blog, you are adorable! I liked you both on Facebook! Such a cute bag! Would make a perfect new spring/summer purse! What a beautiful giveaway. I'm going right now to enter. Tiffibugs208@yahoo.com!! And I'm in love with this outfit! That scarf is everything under the sun! Love all the colors ~ my favorite has to be the light blue one though! The bag is fab. Love love love! I follow them on facebook and instagram and of course follow you on both as well. Absolutely love this bag!!!!! So awesome!!! I love how the scarf and bad make the outfit. Love these bags. Gorgeous. The red one is my favorite. What a great giveaway, would love to win!! Nice giveaway! Love the mustard bag! Completely in love with the Camel Brown handbag!! It'll go with everything! Love your style AND love this fabulous bag! Would love to win! Love the handbag! I followed Mimi's on FB and started following you on FB. Fingers crossed! I love the bag and your blog! Thanks for the giveaway! I hope its international. LOVE ALL OF THE COLORS!!!! I'M GOING IN FOR THE WIN!!! Love the mustard and baby blue color! What a stylish bag, you look lovely! This bag is gorg! & I'm a new fan of your blog! Love the bag in black! Followed all the requirements! Hope I win! the red bag is gorgeous! Great giveaway! Need that cobalt bag! I love your scarf and outfit! Super cute. Also, these bags are absolutely gorgeous! I'm obsessed with the orange one, since orange bags are kind of my signature thing. OMG i'd have such a hard time choosing! They're all cute :) Love your outfit...it makes me want the yellow purse! Secondly: Girlfriend I adore the outfit... your closet is my dream closet. Thirdly: Its AMAZING !!! Im so happy that your doing this giveaway cause I needed a new bag.. (think im going to choose the yellow.. its inspiring) ...a touch of yellow/mustard is important.. just like you posted a couple of months ago. Loooove them ! So chic and classic ! Love the blue one the most ! Following/Liked Mimi Boutique on Facebook! Following Mimi Boutique on Instagram! Following/Liked Fash Boulevard on Facebook! Following Fash Boulevard on Instagram! Following and liking all of the above!!! Love all the bags but my favorite is probably the yellow. Following and have liked both Fash and Mimi! Adorable handbag! Love the yellow!! Gorgeous bags!! I love the mustard yellow one although I'd be happy to win any of them! Started following Mimiboutique and I already follow you!! The blue and yellow are equally fabulous! The yellow one is amazing. Can't wait to hold one in red! Fingers crossed!!! I love That bag!! I love it in camel brown especially now that my favorite brown purse is about to fall apart and I was beginning to search for a new one!! I follow you on Instagram and liked Mimi's on fb! Adorable outfit! Love your blog and posts on LC. Love that scarf and handbag! You look so chic! Awesome giveaway! I see that style of bag everywhere.. definitely want to buy one for myself! lovely scarve and style. Love your outfit and of course your stunning bag. I follow you both on instagram and facebook. thank you Anna for your sweet comment on my blog.